KREATIVEassassin: Part 1: Have You Played Atari Today? Part 1: Have You Played Atari Today? To begin, I feel I should maybe discuss a bit about my history with games. What follows is a several part series of essays I have written about that very topic. These were originally written way back in my MySpace days, but I have cleaned them up and updated them to present here. 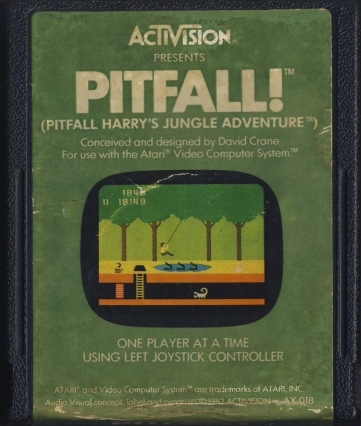 Please enjoy Part 1: Have You Played Atari Today? You can count on one hand the number of years where video games weren't a part of my life. The beginnings of my video game hobby are somewhat a mystery. Because I was too young to remember dates and exact details on the matter, this section, for the most part, is comprised mostly of information that was given to me by my grandma. The origins of me getting the Atari 2600 are mostly second-hand recountings, and I will try to fill in any gaps with my memory. The story goes like this: In 1985, my dad borrowed an Atati 2600 from a man he worked with. This was after the video game crash, so I would assume the owner was looking to get out of the game business. If my memory is true, it was a CX2600 model Atari 2600. We were testing out the console because the man wanted to sell it along with roughly 10 games for $100. I guess we were somewhat poor back in the early eighties, and we did not have enough money to buy the console and games at the time. However, after we ended up passing on the deal, my grandma stepped in and ended up buying it for herself. Watch out for those white jets! 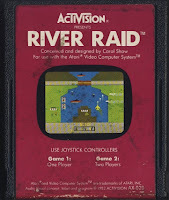 My grandma loved Activision's River Raid, and is very proud to score well over 100,000 points in it. I remember being very young and sitting on the edge of her bed watching her play it. It is the only game I have ever seen her play other than PC Solitaire and Freecell. Eventually, she ended up giving the console and games to me because I liked them so much. This was, presumably, 1986. However, something must have happened to the console (perhaps it began to malfunction or I was suckered in by the advertising) and I ended up getting a Jr. Rev A model from K*B Toys in 1986. I have two distinct memories of buying Atari 2600 games at various places. I remember getting Haunted House at K*B Toys, and I also remember getting E.T., but I don't remember the name of the store I got the latter from. I was pretty into E.T. back then, so it was only natural the game would catch my attention. It wasn't much later when I saw on the internet how the game is viewed by pretty much everyone. As a kid, though, it was the greatest thing ever! Soon after this, I saw the Nintendo Entertainment System for the first time at a friend's house, but more on that experience in the next blog entry. Eventually the Atari 2600 and all my games were boxed up and forgotten. 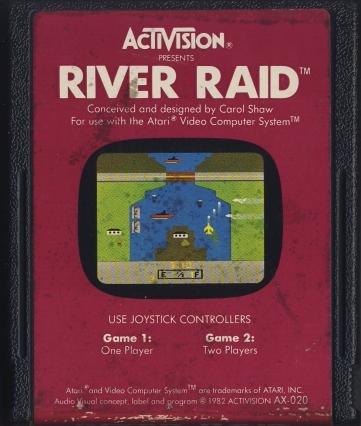 I remember then in the very early 90s unearthing my Atari 2600 from a storage building at my grandparents' house Back then, I felt like the system had been gone for an eternity, but the amount of time I didn't have it out and hooked up really wasn't that long at all. It couldn't have been boxed up for more than six or seven years. It would almost be comparable to me hooking up my GameCube and thinking that it was ancient. Time flows differently when you're a child, and this is a great example of that. Getting the system out again and playing it might have been the first nudge to my current game collecting boom. I found that I still had the original games that we received in the bundle, as well as the few that I acquired as a kid. There were a few that I didn't remember getting, such as Jungle Hunt and Star Raiders, but for the most part I was seeing the games that were the roots of my gaming hobby. I hooked it up and played around with a few of the games, but it had become more of a primitive novelty than a serious gaming experience for me. After I started collecting games, I soon found that I could buy Atari 2600 games at pawn shops for very cheap. Many of the Atari games I got back then were $1 each or less. I bought several throughout the years and ended up with a decent sized collection, though collecting for it was not nearly as important for me as it was for other systems. As such, I have always felt that my knowledge of Atari and its consoles to be inadequate. I haven't taken the time to learn what's rare, what's valuable, or what's fun. Today, the only Atari 2600 games I would pick up if I saw them are Sears Telegames versions of games. I typically don't look through Atari games when I'm out game hunting, though. While the Atari 2600 was my first experience with gaming, it certainly is not the most important console to me. That honor goes to the console featured in the next blog entry. See you next time!